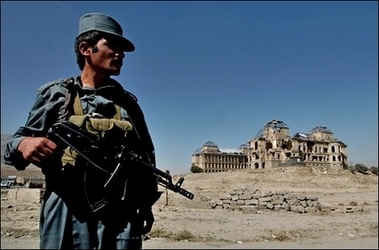 KABUL, Afghanistan - Two battles killed more than 165 Taliban fighters and a US-led coalition soldier in southern Afghanistan on Wednesday as President Hamid Karzai prepared to discuss the escalating violence with President Bush in New York. One of the clashes began Tuesday when several dozen insurgents attacked a joint coalition-Afghan patrol with machine guns, mortars and rocket-propelled grenades near the Taliban-controlled town of Musa Qala in Helmand province, with Taliban reinforcements flowing in all day, a coalition statement said. The coalition said it returned artillery fire and called in fighter aircraft, killing more than 100 of the Taliban fighters. One coalition soldier was killed and four wounded. The coalition said there were no immediate reports of civilian deaths or injuries. Situated in northern Helmand province, Musa Qala and the region around it have seen the heaviest fighting in Afghanistan this year. It is also in the middle of the country's poppy-growing belt.